How useful are Boardgamegeek Ads? There has been some debate on the internet whether Boardgamegeek ads are beneficial, in particular to Kickstarter campaigns. 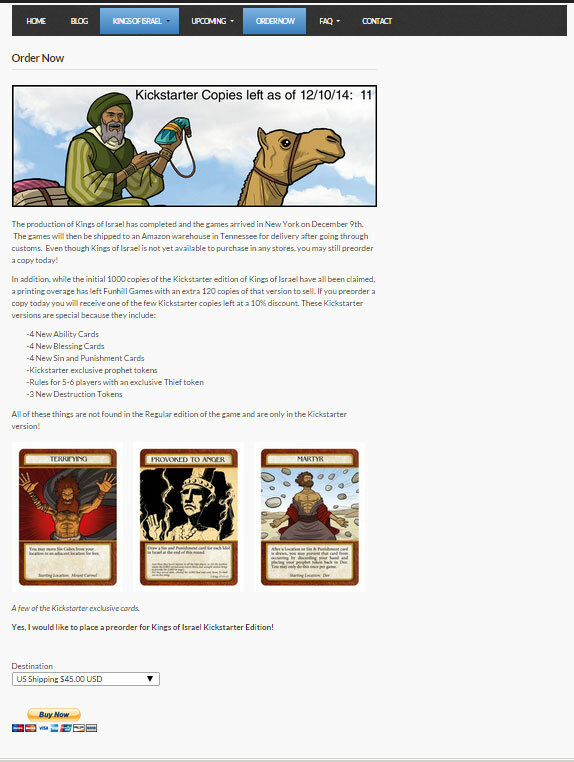 I recently ran a Boardgamegeek front page ad that went to a preorder page for my game, “Kings of Israel“. Now, this was not for a Kickstarter campaign so it is not an ideal comparison, but since it was for a preorder and because of the minimal amount of “static” in the web statistics since it is a slower period in my promotion of Kings of Israel, I think this is a very good example of what Boardgamegeek ads can do. In particular, what a front page ad on Boardgamegeek might accomplish. My first game, Kings of Israel, ran a successful Kickstarter campaign about a year ago ending in November of 2013. For the past year I have had a preorder page for leftover copies of the Kickstarter edition of Kings of Israel, and I would say I average a couple preorders a week depending on events of that week. On a review week, or if Kings of Israel was mentioned elsewhere, it would be higher, but there were a few weeks where not a single preorder would go through. On the last day of my Kickstarter campaign I ran a front page ad on BGG and had a large spike of backers the last day. Since it was the last day of the campaign though, it can be hard to determine whether the ad caused most of the spike or if it was just because it was the last day of the campaign. This time around I reserved a front page ad on BGG for December 10th, around when I thought the games would be ready to be sold. Now, ads on BGG are not cheap. At the moment, taking over the front page ad on BGG costs $200 and it is only available to someone who buys 500,000 impressions of ads besides that front page. So it is $700 minimum to do so. So the plan was to have an ad on BGG on December 10th and then start running other ads on the site for one month beginning that day. Well, it was closing in on December 10th and it became obvious that Kings of Israe would not be available to sell when the ad ran. The games were still out at sea and weren’t expected to reach port until the 9th, so I had a little bit of a problem. I contacted Chad the ad guy at BGG, who is very helpful I might ad, and asked if it was possible to just run the front page ad on the 10th and the rest of my ads later when the games came in, since I knew I was on the hook for the front page on that date. He said that was fine so my plan was to redirect the ad to the preorder page instead and focus on the limited number of copies of the Kickstarter edition of Kings of Israel that are left. At the top I had an image showing how many copies were left and updated it throughout the day. Below it I listed why there were copies left (printing overages) and what special things were found only in the Kickstarter edition. Finally, I had a button at the bottom for preordering using Paypal. The orders were quite steady throughout the day, and by the end of the day I had 25 copies that had been preordered, vs the 1 or 2 copies that might have been preordered on a normal day, so it was a big difference. And there were no new reviews of Kings of Israel that came out that day, no new Podcasts, or mentions on prominent gaming websites. That means I could isolated almost all of those preorders to that one front page ad. But how much traffic did the ad generate on just that one day? Normally, I would have maybe 20-30 sessions to the Funhill Games website when no new reviews, podcasts, etc. have come out, but on the day the front page ad ran I had 637 sessions! And looking at the details from Boardgamegeek, those weren’t just one page visits. On average each session visited 3.68 pages so it was above average in that aspect too. So what kind of return did I receive on my $200 ad? Directly on presales, I probably had an extra $1000 in preorders that I would not have had on that day because of the ad. Besides that, I likely had 600 more visits that I normally would not have had on that day so awareness of Kings of Israel increased quite a bit. Even if that ad did not generate a sale today, it might generate a sale when the game is released since many people do not like to do preorders anyway, they would prefer to order from their normal online sources and so on. The ad ran on a day where nothing else happened so little else affected this data. The front page ad was the only ad that ran, so at the very least it gives a very good idea of what just that ad can do. Kings of Israel is the only game I have produced at this point, so this data is very helpful for new gaming companies trying to get their name out there.. The detailed analytics provided by Google really seem to support the sales information. This ad was for a presale on a Kickstarter version of a game, so the results will be somewhat similar to someone who is running a Kickstarter campaign. While this ad was for a presale, Kings of Israel will be sent out within a month. So while the purchase is not instant gratification, the gratification is not too far off. So that might distort the numbers a little compared to a Kickstarter campaign. It is the Christmas season and the game has a Biblical theme. So this would likely increase interest in the game, but on the other hand it is very likely the game will not ship on time for it to be given as a Christmas present. Not sure how this affected clicks on the ad. The game is a Biblical theme and I put good review quotes in the ad. Biblical games with good reviews you can count on one hand. After that hand has held a cherry bomb. There just aren’t many of these kind of games out there. That could have caused more clicks than maybe a different game that is about selling goods during the Renaissance era. I think those are the variable to consider when reviewing these statistics. In short, I believe that BGG ads more than pay for themselves if you have a quality product and focus on review and availability. If you have any questions or comments feel free to post or send them my way! Thank you for the insight. I too been working on a game, which is also my first. I am also a Christian, & have interest in your game as well. Might you be available to answer some questions regarding your publishing process in the future if the need arises? Thanks, and God bless! Feel free to contact me with any questions, Jake! I plan on writing more article about the publishing process in the future so keep your eyes open in the next month. Any article requests in general? This is a neat breakdown, Lance. I remember watching the numbers go up the last day of the Kickstarter campaign…it was pretty crazy. Actually, if I remember this correctly, the other thing that ended up really helping out that day was that BGG went down for several hours the previous afternoon, when your ad was supposed to be running! So, instead of the ad running until midnight the night before the Kickstarter ended, they let the front page ad run until the campaign closed (which was around 11am or Noon CST). You are correct Scott, we did get an extra half day during the Kickstarter campaign because BGG was down for awhile there, which only helped more. It would be good to compare these stats to regular ads not on the homepage. I can see if I can get those stats out there too Kim, but those won’t be as “clean” as these stats. I plan on running them when the game is out so there will be reviews, podcasts, and other ads out at the same time. This is the rare occasion when an ad stands by itself. I saw the BGG ad a year ago on the last day of the Kickstarter campaign. I would not have known about Kings of Israel otherwise. I sometimes go look at games based on the BGG ads. I think they are effective. We bought the lowest number that we could get so that we could order a front page ad, which was $500. Off the top of my head I don’t remember how many impressions that was but if you have their price sheet it should be about the same. Hi, thank you for your answer. In order to calculate the ratio Clickthrough / Impression, it would be nice to check how many impressions were consumed by THOSE 635 clicks. According to your data, the 635 clicks generated 25 buys, a conversion rate of approx 4%. If we know that ratio, we can calculate predicted revenue from 500 000 impressions, which is what you buy at boardgamegeek. The front page ad clicks do not count against the impressions you pay for through BGG. The click to impression to click ratio of the ads that weren’t the front page banner was about .3% vs. about 1% for the front page ad. Hope that helps! It helps a lot. Thank you. Great insight. I’m back to launching a new game so am looking back into things. My first game I used http://www.boardgamecapital.com and it worked pretty good. I couldn’t complain for $10 a week with over 14,000 views. They also did a great game review for free. I might have to save up more and try BGG – although that’s a lot of money for a small game designer. Kings of Israel copies in the US!